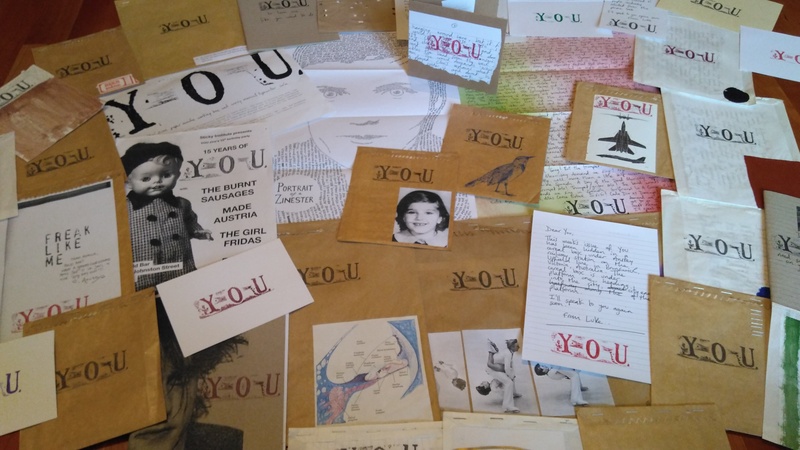 Nyx is well known for the zine review blog, Sea Green Zines, (along with Xerography Debt, it’s our favourite place to learn about new zinesters and titles). Do yourself a favour and check it out here. 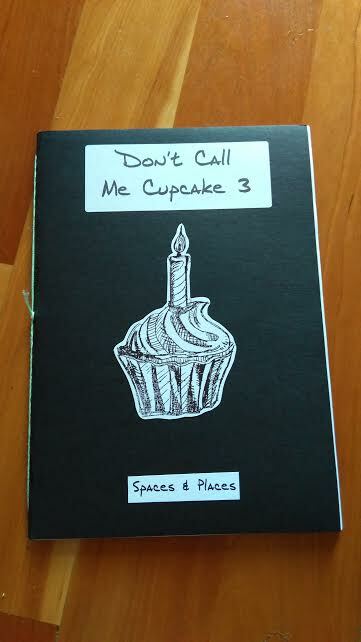 Nyx also publishes a slew of zine titles, including the perzine, Don’t Call Me Cupcake. Highlights of the third issue: Nyx recalling their first zine fair in Australia, roommate travails, which anyone who has cohabitated with others can relate to, and the zine-within-a -zine: “The Care and Feeding of Your New Nyx”, where Nyx has put together a “user manual” for prospective friends. This issue strikes a sombre tone as Nyx is unflinchingly honest about some of the immediate and long-term challenges they are confronting. Nyx welcomes trades and letters, but whatever you do, don’t send tea! Australian customs will confiscate it and send a mean letter. 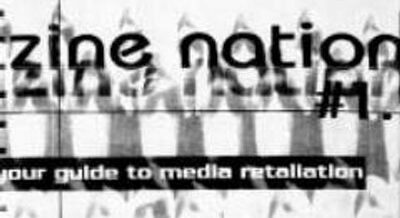 This throwback punk rock zine comes from Don Leach, who has written reviews for Zine Nation in the past. We loved how earnest and straight forward Don’s review style was, so we were enthused to see his fanzine. The content is mixed in form, there’s some short prose pieces, what we presume are lyrics, and even a few short poems. The zine kicks off with Don accomplishing one of his long-term goals: writing and recording a song. 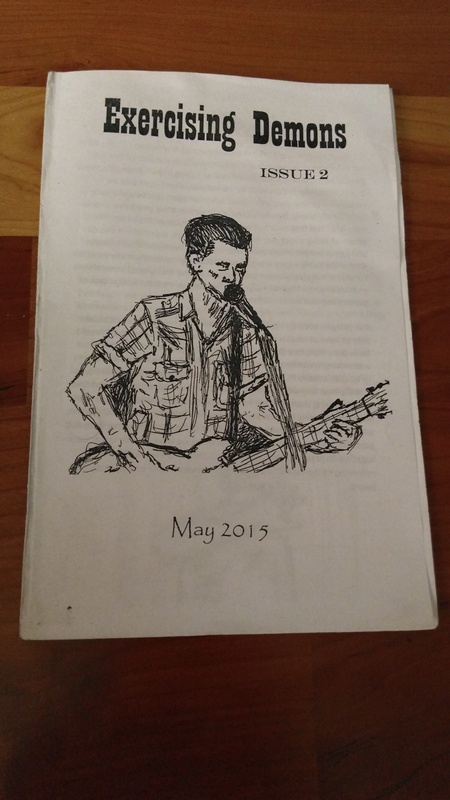 The entrée of the zine are transcriptions of three spoken word pieces Don performed at the Tulsa Story Slam. Two of them recount college life in the 80s, and yes, they do sound a bit like scenes from a John Hughes film. The most memorable of the slams, in my opinion, details some of Don’s experiences serving in Saudi Arabia during the First Gulf War. Both Don’s father and grandfather also served in the military, but he’s adamant that he doesn’t want his young son to follow this path. 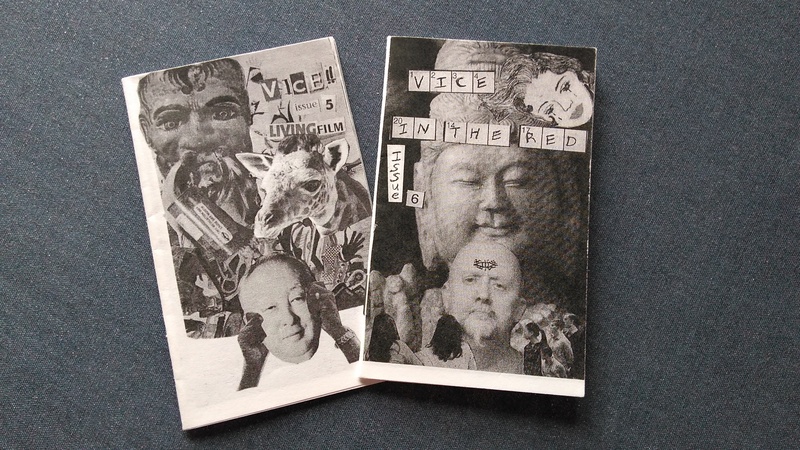 This zine has a lot of heart, and here’s hoping there’s another issue coming out of the copier soon. Don is also an active podcaster and blogger, you can read more about his work here. Side note: There’s often a stereotype perpetuated that the ‘typical’ zinester fits into certain age, racial and gender demographics. True, compared to many other art forms, zines can be slanted towards younger people; nevertheless, beloved zines such as Ker-bloom!, Cometbus, Doris and many others, are produced by zinesters aged 40 plus. This is the second zine we have reviewed this week that features a seasoned zinester writing about growing up in the 1980s. Johnny Masiulewicz has been published in a bunch of lit zines, and is also the author of several poetry collections. This is my first brush with his perzine Happy Tapir, but hopefully it won’t be my last. Happy Tapir #2 details one summer in the mid 80’s when Johnny travelled from Chicago to Washington to work on an orchard owned by a friend’s family. 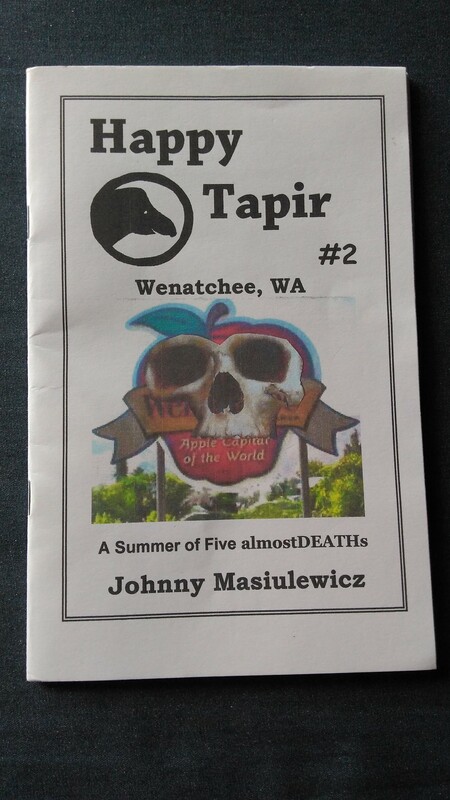 This zine is subtitled: A Summer of Five Almost Deaths. These near deaths listed in chronological order are: a car crash, drowning in quick sand, an explosion, falling off the side of a mountain, and being attacked by a wolf. Those near fatal brushes and the ensuing drama hook the reader onward, and also serve as a framing device for the narrative, often it was the in-between sections of the story that appealed to me the most. The text is broken up nicely with pictures that complement the story, and even provoke a deeper and more participatory reading. When you see the 1972 mustard yellow Chevy, or the Sony Walkman, you find yourself more immersed in the story. The unironic love of Journey, Duran Duran and Wang Chung also made me chuckle. Often when reviewing a zine, I’ll read the first few pages and then quickly skim the remainder to get a sense of the issue before returning to it later for a more detailed examination; I read this straight through cover to cover, barely stopping for a breath. 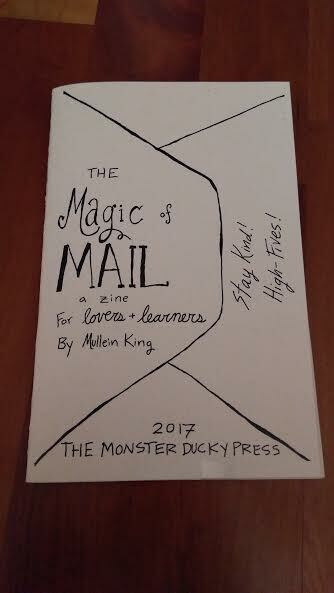 This zine is a how-to guide which covers letter writing, finding pen pals, and decorating mail art, among other postal related topics. Not sure how to properly address a letter? This zine has got you covered. As anyone who has ever worked a mailroom, or in direct advertising can confirm, mail etiquette is surprisingly complex and varies depending on geography. This zine is a brisk, yet thorough read on the subject. I love it when you order a zine and there is a rabble of homemade flyers, buttons or stickers included. This zine was accompanied by a jumble of other flyers, including call outs for both a mail art club and a mix tape club, and even a distro catalogue. Looking forward to seeing what’s coming next from The Monster Ducky Press. 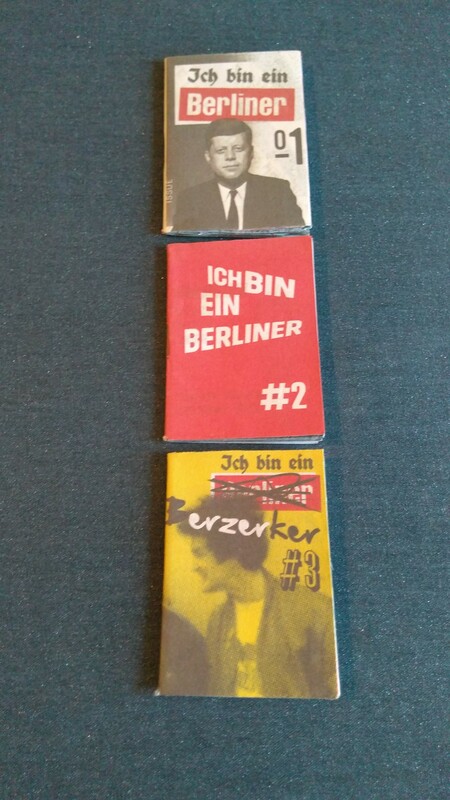 I flipped through these Danish zines quickly, almost casually, and at first glance I overlooked the understated brilliance of them. Notebookdrawings is a zine that defies standard categorization. It’s highly allegorical and filled with witty visual puns. The line drawings use the principle of repetition to great effect. Think of this as notebook hieroglyphics. Most of the drawings or sketches incorporate the lines of the ruled paper into the artwork in a manner that we’ve never seen before. We adored so many of the pieces, but some standouts for us were: the Avantgardenist, Sisyphus as a postman, the department of rejection letters, and networking strategies. These zines introduce an exciting and unique new voice to the small press world and we anticipate great things for Mette. 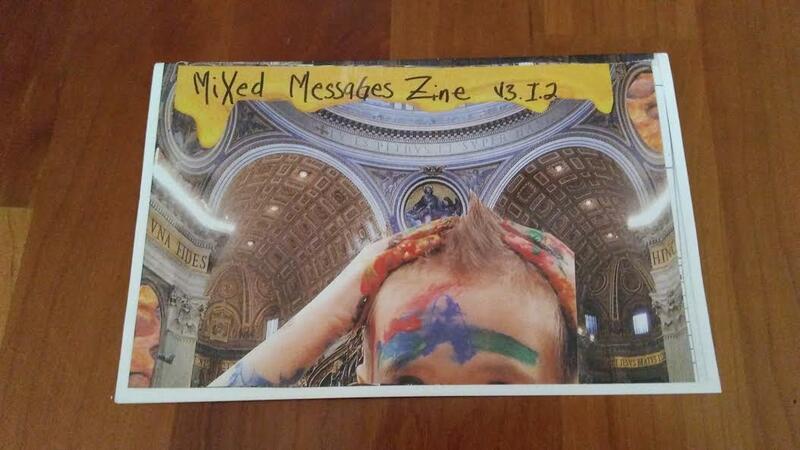 Mixed Messages Zine is a 100% submission based cut-n-paste collaboration project based out of New York State. Hundreds of people from across the globe mail in pictures and photos and clippings, and the editor molds them all into a cohesive piece. This issue consists of three strange and wonderful full-page collages. This zine harkens back to the 90s when mail art networks were commonplace. Mail art has a long and interesting history dating back to the mid twentieth century. The zine has a self addressed stamped envelope stapled to the back, with an invitation to submit to the next issue. This is one of our favourite new titles, and it should be interesting to see how this zine develops over the next few years as more people are exposed to it; Mixed Messages could evolve into a collage version of Craphound. Check out the Tumblr and Instagram pages to see how you can get involved! 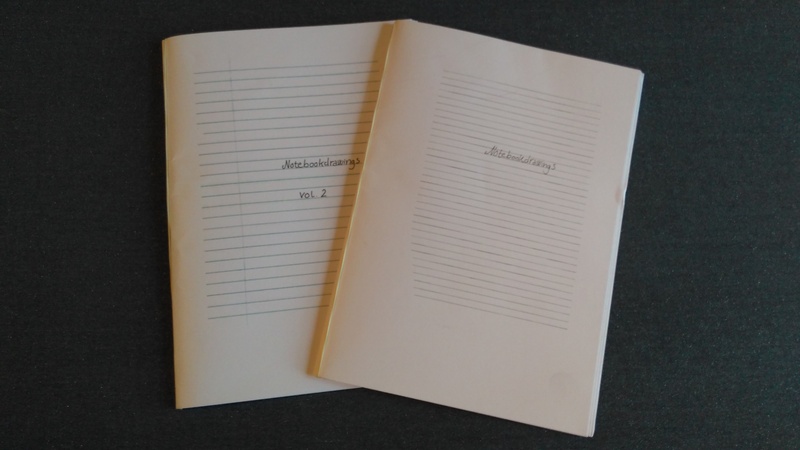 For several years, we have wondered: when would a zinester write a play, or when would a playwright employ the zine format to publish a play? Cue Te Hao Boon’s zine play, The Other Side. The action of this one act play centers on three snails who are travelling on a perilous journey to a location just a few metres away. The snail’s world is one ripe with danger at every turn, cars, cyclists, even joggers serve as natural predators. Even though this is a light comedy, suffice to say, the story doesn’t end well for our well intentioned, but haphazard protagonists. Admittedly, the plot is a tad underdeveloped and the script need some tightening, but it’s a great start. I don’t normally offer advice in a zine review, that would be pretentious, but I feel compelled to make an exception here. I would love to see Te Hao Boon expand their scope and explore more consequential subject matter. Te Hao has a solid foundation in theatre fundamentals, no doubt aided by their previous experience as an actor, and unlike so many early plays by many great writers, this play has a clearly defined, beginning, middle and end; it is structurally sound. This week my partner and I attended the Fringe Festival, and we saw a lot of promising plays that had riveting plots and compelling characters, but they often ran out of steam in the third act, or sometimes they didn’t have a third act at all, the play just ends, as if the playwright has run out of energy, or doesn’t know how to wrap up the story. 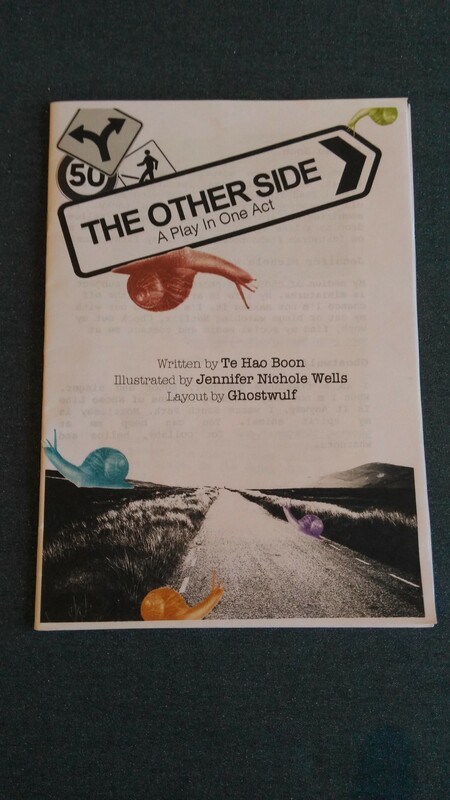 The Other Side serves as evidence that Te Hao Boon is sure to develop into an amazing young playwright. It should be fun to watch. This gritty cut-n-paste perzine offers brief glimpses into Shayan’s life; their travels, their workplace and what music they like. You either love or hate the perzine format, some people, myself included, really enjoy reading about random day-to-day moments in stranger’s lives. Issue 6 starts off with an astute and very detailed description of fellow travellers on a California train. It reminded me a bit of Eddy Joe Cotton’s Hobo. There’s also a humorous dream analysis, a review of a My Bloody Valentine album, comix and some cool photography. Issue 5 details Shayan’s first job at a call center, and contains more hilariously on-point descriptions of select co-workers. What makes these characterizations so appealing is that Shayan can showcase idiosyncrasies and unappealing personality quirks in an entertaining, yet humane way. In this issue Shayan writes a bit about their fish collection, and a blue parakeet. There’s also some well written reviews of tracks by Sterociti and CV313. Shayan also makes music, and once we get through this pile of zines to review, we plan to have a listen. Christmas came in July this year. Our neigbours often smote their foreheads or furrow their brows when they see us retrieve our mail. So many envelopes. What are those people up to? When we saw a bulky postmarked package from Australia, we knew we were in store for a dose of zine virtuosity. We ripped open the package with near delirious relish. You is a free, anonymous, paper zine that usually takes the form of a letter addressed to an unnamed recipient, signed from “Luke”. The zine has been published weekly since November 2001, and issue #800 was launched this past February at the Festival of the Photocopier Zine Fair. You is available every week from Sticky Institute, Quimby’s Chicago, Pioneers Press, Take Care Distro, Small Zine Volcano, and numerous other distro points and zine libraries. Whenever we are asked to identify zines that push the boundaries of traditional zine forms in unique and sometimes deliciously perplexing ways, we always cite You. In this batch of issues alone, there are broadsheets, postcards, flyers, pamphlets, mini-posters and even a cd containing recordings of Luke reading previous issues of the zine. One of our favourite issues documents seeing The Cure in rich detail, and two You postcards really caught our eye as well. The first reads: “this week’s issue of You has been hidden in a cereal box under Anstey railway station on the Upfield line in Brunswick, Victoria, Australia”. The second says: “this week’s issue of You, was mailed to people randomly selected from the phone book”. You is a one-of-a-kind project that we simply can’t get enough of.